Got my Army Painter spray through the post yesterday and I have to say I'm not particularly impressed: it's left a fairly textured pattern on the models (not quite grainy, just blobby). I'm confident it isn't user error (I've been doing this almost 20 years). Anyway, I've primed 18 marines using this tin in one go but I may do the other stuff one at a time in case it persists. 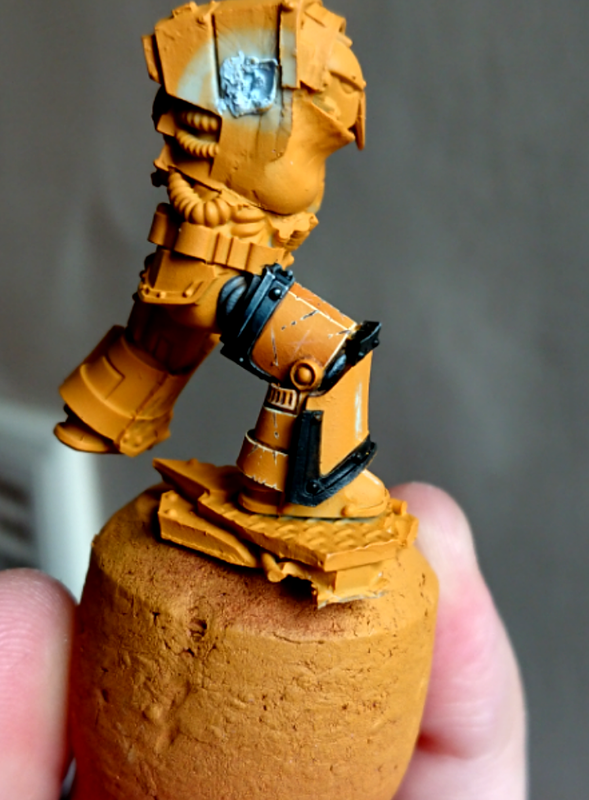 How's this for a rough'n'ready Imperial Fist? From my own observations, and a few others I've seen recently, the Army Painter rattlecans have gone waaaaaaaaay down in quality, which is very sad. Looks good. Still need to trill out the gun barrel and paint the vents back. Oh and pick up some decals, the FW ones are amazing but they are a little short on the fist legion symbol, I've nearly run out, serves me right for running an army of grunts I guess. Cheers. Yeah I noticed that none of the gun barrels have been drilled after priming all 18 of the squad (I got them in a swap). You are correct OMN, I need to paint the vents. Will attempt to get a load busted out this week. Then I can start the Terminators. Exciting to see you on some 30k fists! I'm a fan of the scheme and if it's efficient, then all the better! Mengel does some extra glazing and highlighting but I'm just trying to get the Mk.IV dudes smashed out. I will spend more time on the Terminators and obviously take pains to make the characters look good. But the Mk.IVs? They're there to die. Sounds good, looks good, what more can you ask for? Looking forward to seeing the squad all together and how the scheme looks on the Terminators. Thanks youwashock. I'm not that great at using glazes and so it has a tendency to pool slightly and leave other areas looking washed out. I'm just glad that the trend is to have marines look incredibly battle damaged (which I quite like anyway) as it hides all manner of sins! Stopping by the PO Depot on my way home to pick up the Limited Ed Praetor Tribune I won off ebay. Assembling him will be my motivation to get the Tac Squad painted. Looking good. Going to very cool when they are done. Awesome work, great finish to these. So again, I'm just checking in to say that I am still alive and I actually did something hobby related yesterday: I undercoated all of my Tartaros Terminators and continued with the panel lining stage of the power/terminator armour. A friend of mine is starting a Mechanicum army to go along with his Militia list so we are going to build our armies together as an incentive. We're going to do a Centurion list so we only need one HQ and one Troops choice as a basis: I've already got a Praetor, 10 Terminators and 15+ Marines so I have a bit of a head start. I am thinking of changing the method of painting though... I'm not sure the method I have been using for infantry will work so well on vehicles: what say you? I've entered the Dakka Painting Challenge for August with five Tartaros Terminators from the above batch of 10 (the ones with ranged weaponry will be the entry). 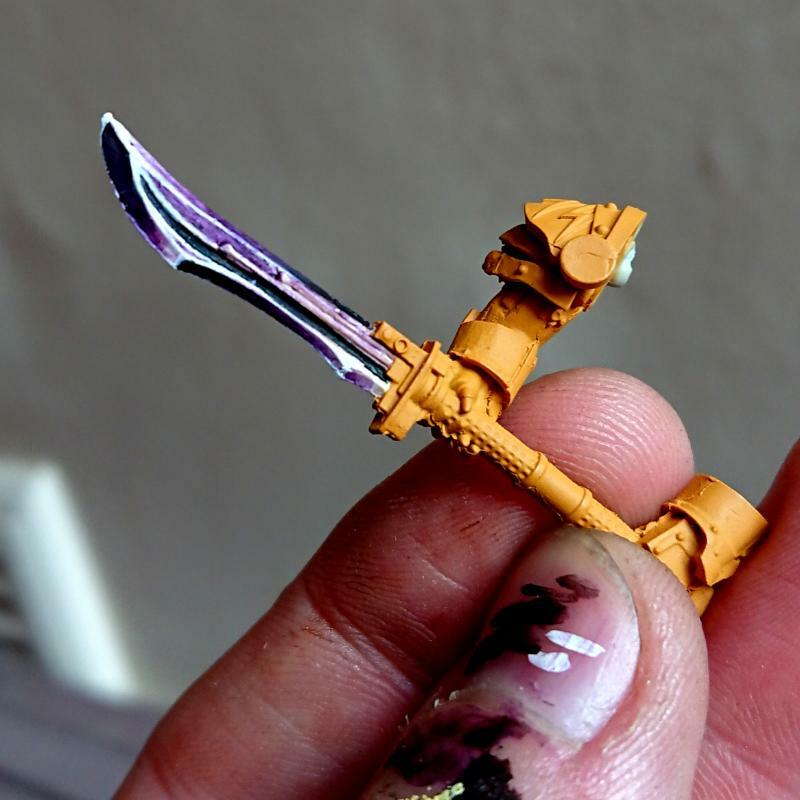 Have changed the scheme as the Army Painter Skeleton Bone spray is, in my opinion, utter garbage. GeeDub's Averland Sunset on the other hand is awesome. Bummer about the AP spray. Looks like the replacement is doing a fine job. Looking forward to seeing them done. Bit of progress! Was too blody hot to paint today, I doubt even using a wet palette would have improved things... Anyway, this is pretty much how the Terminators will look. Decided to free-hand the symbols since I'm just weathering over them anyway. Guns are going to be gunmetal, so Ironbreaker with heavy washes of Nuln Oil and Agrax and then drybrushed Ironbreaker again (yet to finish). Awesome! 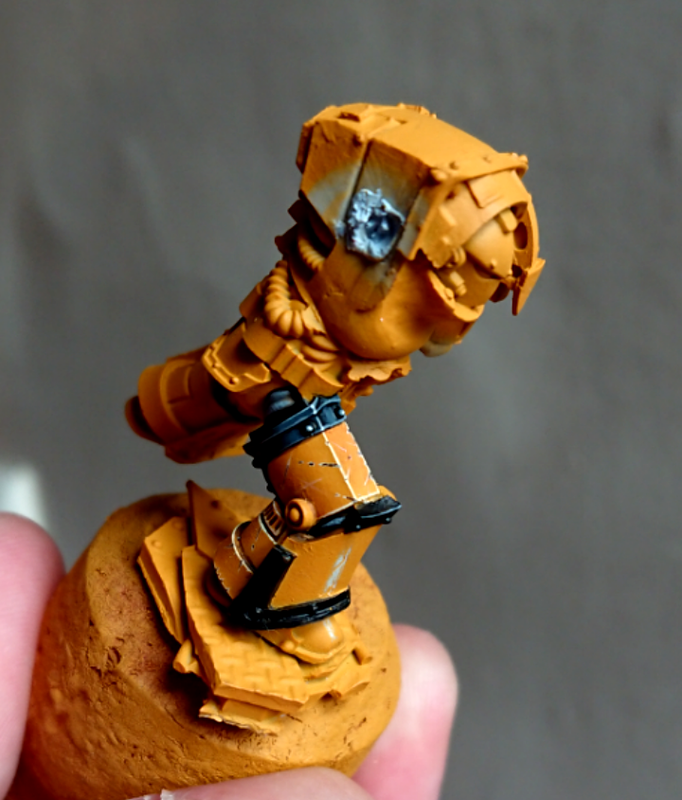 That deep, almost ochre yellow with the heavy weathering looks amazing! Have since gone back to painting the Tartaros and I'm now in the process of blacking out the shoulder pads and weapons. That's lovely! Nothing wrong with putting a bit of extra effort/neatness into the centrepiece models, so yes it's a slightly different style but still one that's great to look at. What are you using to get that lightest highlight? Off-white, or just a light yellow? The base colour is Averland Sunset and the shadows are added using glazes of Skrag Brown. The deepest shadows have a touch of VMA German Camo Black Brown in with the Skrag amd I've used the same Black Brown to line the panels. Whoa, that looks fantastic. Loving the effect on the Praetor. All in all, these boys are going to look like they have seen plenty of action. but rather keep watch o'er his wits. than the wealth of mother wit. That is really very nice and sharp. Good job.